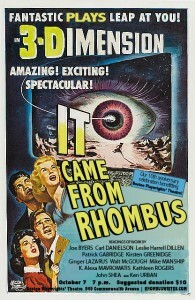 It Came From Rhombus – October 7! 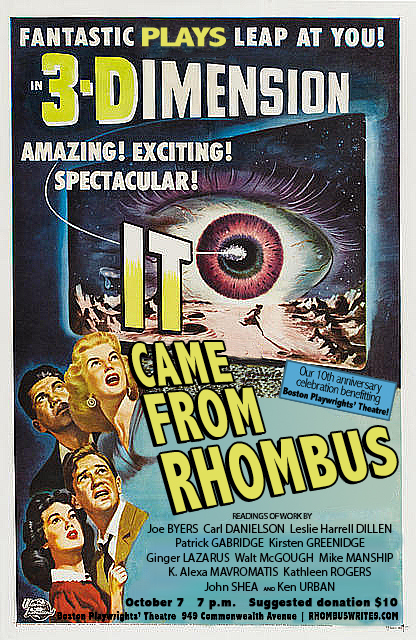 Come celebrate our 10th anniversary with an evening of readings of scenes from all 12 past and present Rhombus playwrights. (Joe Byers will be coming in from Philly and Leslie Harrell Dillen will be coming all the way from New Mexico!) In addition to fun scenes read by some of our favorite actors, we’ll have plenty of tasty snacks and the evening is a fundraiser for Boston Playwrights’ Theatre. (Our way of saying thanks for 10 years of support.) Suggested donation $10. Our fabulous actors that night will include: Becca A. Lewis, Mal Malme, Paul Vincent Melendy, Robert D. Murphy, Sarah Newhouse, Dale Place, Omar Robinson, Christine Power, and Jessica Webb.